Thomas' (Achilles) one-year deal with the Patriots carries a salary cap hit of $2.9 million, Ryan Hannable of WEEI.com reports. Thomas (Achilles) is signing with the Patriots, Field Yates of ESPN reports. Thomas (Achilles) visited with the Patriots on Wednesday, Field Yates of ESPN reports. Thomas (Achilles) pleaded guilty Wednesday to a careless driving charge stemming from his car accident Feb. 16 in Denver, Matt Young of the Houston Chronicle reports. Thomas (Achilles) was arrested on charges of vehicular assault related to a single-vehicle rollover crash earlier this month, Joe Dahlke of FOX31 Denver reports. Analysis: Thomas was allegedly driving 70 miles per hour in a 30 mph zone and then lost control of his car before rolling over and coming to a stop somewhere off the road. There were two passengers in the vehicle, one of which suffered "serious bodily injuries" as a result of the accident. Thomas, an unrestricted free agent, apparently has a history of driving-related offenses and it's possible he could receive punishment from the league. Thomas (Achilles) sustained minor injuries in a single-vehicle crash early Saturday morning, Ian Rapoport of NFL Network reports. Analysis: Thomas was identified as the driver in the vehicle rollover, while one of the other two individuals in the car suffered possible serious injuries, though they don't appear life-threatening. 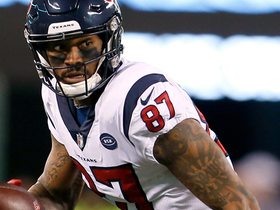 The veteran wide receiver is a free agent after being released by the Texans on Thursday, and his status for the start of the 2019 season is in limbo after he ruptured his Achilles in December. The Texans will release Thomas (Achilles) on Tuesday, Aaron Wilson of the Houston Chronicle reports. Thomas (Achilles) said he'd like to finish his career in a Texans uniform, Aaron Wilson of the Houston Chronicle reports. The Texans placed Thomas (Achilles) on injured reserve Monday, Field Yates of ESPN reports. Analysis: This move was routine as a result of the torn Achilles suffered by Thomas in Week 16, thus ending his seven-game run with the Texans with 23 catches (on 33 targets) for 275 yards and two touchdowns. Because his $14 million salary for 2019 isn't guaranteed, he may have played his last down with his second organization. Expect Thomas (who turns 31 on Christmas Day) to focus primarily on rehab in the offseason with an eye on a prove-it deal for next season. Thomas suffered a ruptured Achilles during Sunday's loss to the Eagles and will miss the remainder of the season, Aaron Wilson of the Houston Chronicle reports. Analysis: Thomas was unable to put any weight on his leg and was carted off the field in the fourth quarter. He will undergo surgery to repair the damage and be placed on injured reserve. The injury opens up playing time for rookie Vyncint Smith, who caught his first NFL touchdown pass after Thomas left the game, and DeAndre Carter. 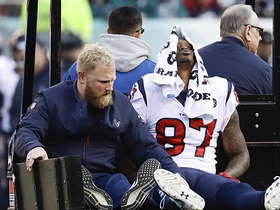 Though coach Bill O'Brien didn't have an update on Thomas' status immediately following Sunday's loss to the Eagles, it's feared that the wideout suffered a torn Achilles, NFL.com reports. Analysis: With Will Fuller (knee) on IR and Keke Coutee dealing with a nagging hamstring issue, this is an injury that the 10-5 Texans can ill-afford so close to the playoffs. If Thomas' injury is as severe as feared, Vyncint Smith's profile in the Houston offense would figure to expand going forward. Thomas (Achilles) was carted off the field during Sunday's game against the Eagles, Aaron Wilson of the Houston Chronicle reports. Analysis: Per Wilson, Thomas couldn't put any weight on his left leg, which suggests a potentially serious issue. Vyncint Smith has replaced Thomas in his spot at wideout. Thomas caught six of eight targets for 59 yards in Saturday's 29-22 win over the Jets. 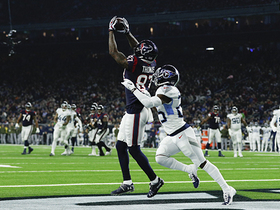 Analysis: Thomas was relatively quiet until the Texans' game-winning drive late in the fourth quarter, when he caught three passes for 29 yards to help set up a touchdown to DeAndre Hopkins. The yardage is Thomas' highest total since he had 61 receiving yards in his debut for the Texans in Week 9. 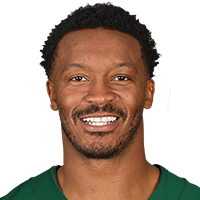 The 30-year-old has been unable to take advantage the last three games with Keke Coutee (hamstring) sidelined, and his modest production keeps him as a touchdown-reliant fantasy play. Thomas caught four of six passing attempts for 48 yards in Sunday's 24-21 loss to Indianapolis. Analysis: The effort marks Thomas' second-best since coming to Houston from Denver prior to Week 9. Since then, he has not exceeded 61 yards or four catches in any game. The 30-year-old will be a touchdown-dependent play on the road Week 15 against the Jets. Thomas caught three of five targets for 32 yards in Sunday's 29-13 win over the Browns. Analysis: Thomas finished as part of a three-way tie for second on the team in receiving yards behind DeAndre Hopkins' 91. Though Thomas did catch a pair of touchdowns last week, he's averaging just 32.8 yards through his first four games in a Texans uniform. Owners relying on Thomas in Week 14 against the Colts will likely need a touchdown to get satisfactory output from the big-bodied receiver. Thomas caught four of five targets for 38 yards and two touchdowns in Monday night's 34-17 win over the Titans. Coach Bill O'Brien said he needs to do a better job of getting Thomas more involved in the offense, Aaron Wilson of the Houston Chronicle reports. Thomas failed to catch his lone target in Sunday's 23-21 win over the Redskins. Analysis: So much for an expanded role. 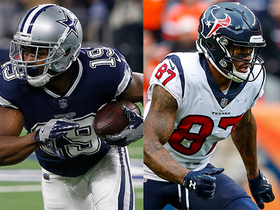 DeAndre Hopkins and Keke Coutee (hamstring) remain the wide receivers to own ahead of Houston's Week 12 meeting with the Titans, as Thomas is still adjusting to his new surroundings after coming over from Denver in a trade. Thomas is expected to gain more involvement in the Houston offense in Sunday's game against the Redskins, Drew Dougherty of the Texans' official site reports. Thomas and the Texans are using their Week 10 bye as an opportunity to expose the wide receiver to a fuller version of the offensive playbook, Aaron Wilson of the Houston Chronicle reports. Thomas caught all three of his targets, totaling 61 yards during Sunday's 19-17 road win over Denver. 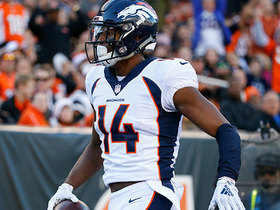 Thomas could be in line for significant playing time after Houston declared Keke Coutee (hamstring) out for Sunday's game in Denver. Analysis: Coutee did not travel with the team, leaving the Texans without two of its significant targets at wide receiver -- Will Fuller (knee, IR) being the other. Whether or not Thomas has command of the full playbook, it appears he'll get a heavy dose of snaps, which could potentially lead to a good deal of targets. Head coach Bill O'Brien previously downplayed Thomas' learning curve, citing the nine-year veteran's extensive experience within offensive systems in the NFL. Thomas will start Sunday against the Broncos, Aaron Wilson of the Houston Chronicle reports. 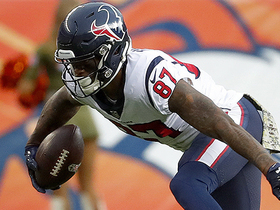 NFL Network Insider Ian Rapoport discusses Houston Texans wide receiver Demaryius Thomas' season-ending injury. Houston Texans wide receiver Demaryius Thomas makes shoestring catch as he falls backwards. 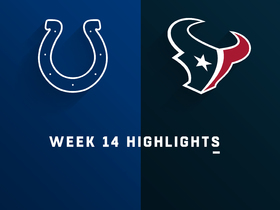 Watch the highlights as the Indianapolis Colts take on the Houston Texans in Week 14. Houston Texans wide receiver Demaryius Thomas speeds through defenders on a 19-yard catch and run. 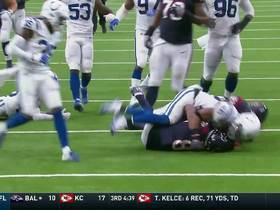 Houston Texans wide receiver Demaryius Thomas reaches to grab a 20-yard dart from quarterback Deshaun Watson. NFL Network's "NFL Fantasy Live" crew reveals which players they believe are poised to see more touches in Week 14 and beyond. 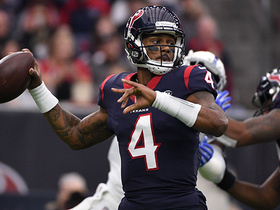 Houston Texans Demaryius Thomas gets his second touchdown on a 10-yard pass from quarterback Deshaun Watson. 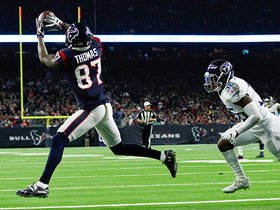 Houston Texans wide receiver Demaryius Thomas hauls in his first touchdown as a Texan. NFL Network's Fantasy live crew recaps some of the most-surprising fantasy performances from Week 11. NFL Network's Fantasy Live predict projected points for Week 10 of the 2018 season for newly traded wide receivers at their new teams.